Wine-drinking is an intrinsic part of Italy’s culture, and this is why the country boasts a total of 20 wine regions. No tour to Italy could possibly be complete without an Italian wine experience. So whether you’re visiting Venice, Milan, Rome or Sicily towns, you’ll definitely come across a chance to taste Italian wines. We’ve put together a guide on everything you need to know about Italian wines, broken down by the most visited cities in Italy. If you’re traveling to Milan and Como, prepare to pop the bubbly as the most famous wines of the Lombardy region are Franciacorta and Lambrusco sparkling wines. Wine grapes are considered especially great here thanks to the clear water of Lake Garda. Among the wide selection of wines on offer, white Lugana wine or the Riesling Italico are great blends worthy of tasting. As for classic red wines, those from the Valtellina valley, such as Rosso di Valtellina, a bright cherry-scented wine made of Nebbiolo grapes, as well as fruity Groppello are ranked the finest. The Veneto wine region in Northeastern Italy is the largest wine-producer of the country. It is renown for its diversity of wine made of various grape types, including Covina, Molinara, and Rondinelli. When going to Venice or Verona, we advise treating yourself to a bottle of Prosecco sparkling wine or Soave white wine made of Garganega grapes. If you’re a fan of fine reds, make sure to taste Bardolino, Valpolicella or Amarone wine, produced in the sub-region of Lugana bordering with Lombardy. For those exploring the inspiring Cinque Terre towns and historic Genoa, wines of the surrounding Liguria wine region are a must-try. Most Ligurian wines are created by artisanal producers whose vineyards occupy steep rocky slopes, meaning that local wineries usually don’t have a massive wine production, among such unique wines, are Buzzeto and Granacchia. However, the most famous wines of the region are the dry whites such as Cinque Terre or Cinque Terre Sciacchetra, and Rossese di Dolceacqua which is one of the finest red wines in Liguria. 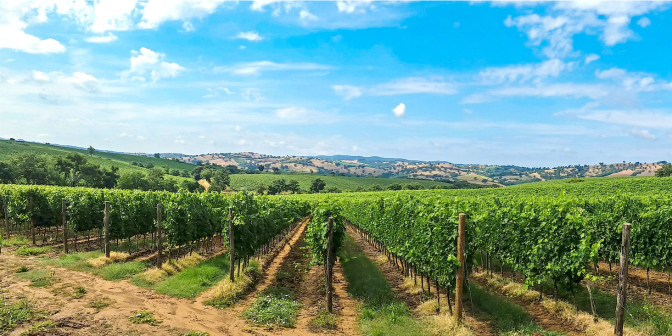 The best-known wine region in Italy is certainly the Tuscany, attracting visitors not only with exceptional wines but also with picturesque landscapes and beautiful vineyards. Grapes mostly grown here in the Florentine area are Sangiovese, Colorino, and Canaiolo. Vin Santo dessert wine is a flavorful Tuscan treat we would recommend, whereas Chianti red wine is of specific interest for wine enthusiasts. Other noted Tuscan wines are Brunello di Montalcino (traditionally produced in Montalcino) and Vino Nobile di Montepulciano (famous product of the medieval Montepulciano settlement) which are of a bit higher price range. The wine region in the area around the Italian capital Rome, Lazio is often called Latium. The region mainly specializes in the production of white wine mostly using the Trebbiano and Malvasia di Candia grapes. We would recommend tasting a glass of Castelli Romani, Frascati or Est! Est! Est! wine. For reds, Cesanese del Piglio is the one that especially stands out. Sicilian wine producers are also adherents of quality. Therefore, those visiting the island of Sicily will surely enjoy the diversity of fine local wines. Bianco d’Alcamo is a widely recognized dry white wine. There are also many fine dry red wines such as those from Cerasuolo di Vittoria. Sweet Marsala and Moscato wines are another Sicilian treats worth mentioning. When planning a trip to this European beauty, save some time for tasting a couple of its delicious wines. The country is not only the largest producer of this drink in the world by volume, but it also treasures some of the oldest wineries in Europe and offers travelers an incredible variety of wine to complement any Italy tour.